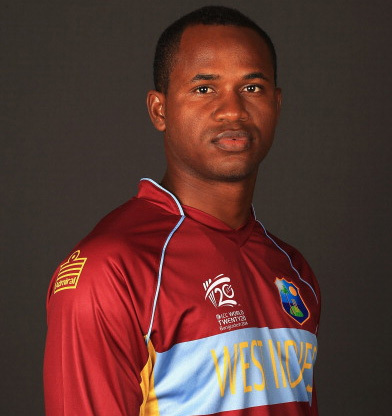 Marlon Nathaniel Samuels (born 5 February 1981) is a Jamaican cricketer who plays internationally for the West Indies. He is a right-handed middle order batsman and an off-spinner. Samuels made his Test debut in Australia in 2000, and his One Day International debut against Sri Lanka in Nairobi during the ICC Knockout Trophy in the same year. 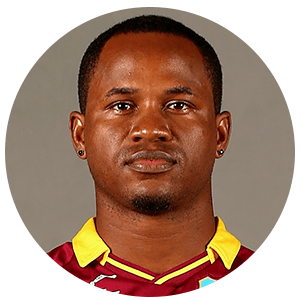 He was a key member of the West Indies team that won the 2012 ICC World Twenty20 and 2016 ICC World Twenty20, and was named man of the match in the final of both tournaments, becoming first man to do so. In 2013 he was named one of the Wisden cricketers of the year. He was one of the franchise players for the inaugural Caribbean Premier League. In 2016 the West Indies Cricket Board named Samuels as the ODI Player of the Year and the Cricketer of the Year. Samuels scored his maiden Test hundred at Kolkata against the Indians in 2002/03. His innings of 104 helped the West Indies to draw the 3rd Test and was made against the likes of Javagal Srinath, Anil Kumble and Harbhajan Singh. His first ODI ton came in the series which followed and turned out to be a series winning innings. With the series level at 3–3 going into the final match at Vijayawada on 24 November 2002, Samuels smacked 108 not out off just 75 balls. The West Indies finished with 315 and went on to win by 135 runs. During the West Indies tour of Australia, on 9 October 2005 Samuels registered his highest first-class score with an innings of 257. It was made in a tour match against Queensland at the Gabba. His effort was a record score at the ground, beating Martin Love's 250. Showing his allround abilities, he followed it up with 5 wickets in the next innings. He played in two Tests on the tour, with a highest score of 29, before he was sent home with a knee injury. Against Pakistan at Multan in late 2006, Samuels scored his second ODI century. His unbeaten 100 led the West Indies to victory as they successfully chased the Pakistani total. He fell just short of another century a month later against the Indians in Chennai but his quick fire 98 helped his side chase down India's 268. Samuels also played as part of the Pro Cricket league in the United States for the Chicago Tornadoes. In January 2007, Samuels was named man of the match after scoring 94 and 40 in the first Test against South Africa in Port Elizabeth, a match the West Indies won by 128 runs. He went on to score his second Test hundred, in the final match, hitting 105 although it wasn't enough for his side to win the match or the series. Samuels was involved in the run-out of Brian Lara in his last international match, against England during the 2007 World Cup. Lara was on 18, when Samuels signalled for a quick run but was unable to reach the other wicket in time as Kevin Pietersen underarmed the ball to hit the stumps. After the World Cup, the West Indies toured England in May. Unexpectedly Samuels was not initially included in the squad for the Test leg, but was called up as a replacement when Ramnaresh Sarwan suffered an injury. On 4 July Samuels made 77 runs from 104 balls against England in the second Natwest ODI. He and Shivnarine Chanderpaul scored a record third wicket partnership of 175 runs at Edgbaston in a game West Indies won. On 25 February 2008 Samuels was suspended from bowling in international cricket until he corrects his bowling action, which has been deemed suspect. Indian police accused Samuels of giving out team information to a known bookie prior to the 1st ODI between the West Indies and India in Nagpur on 21 January 2007. It was claimed that they have taped telephone conversations between a bookmaker, Mukesh Kochchar, and Samuels. The transcript was later released by the police. After a hearing into the matter, in May the International Cricket Council enforced a two-year ban on the 27-year-old for "receiving money, or benefit or other reward that could bring him or the game of cricket into disrepute". Samuels maintained his innocence. The Bangladesh Cricket Board founded the six-team Bangladesh Premier League in 2012, a twenty20 tournament to be held in February that year. An auction was held for teams to buy players, and Samuels was bought by the Duronto Rajshahi for $360,000. He was the team's highest run-scorer with 242 from 11 innings in the competition. In February 2012, Samuels signed a contract with Pune Warriors India to play for them in the 2012 and 2013 Indian Premier League (IPL). The 2012 IPL clashed with Australia's tour of the West Indies, and Samuels was granted permission to skip the three Test series and play in the league. During the tournament he was reported for having a suspect bowling action, and suspended from bowling in the rest of the competition. Samuels was selected in the West Indies Test squad to tour England after the IPL. In the first Test Samuels combined with Chanderpaul in a 157-run stand. However, with England batting on the final day to win the match Samuels was asked to bowl. His part-time off spin was called upon as the West Indies had entered the match without a specialist spinner, while Shannon Gabriel was injured and Fidel Edwards ineffective. Samuels scored his third Test century in his next innings, and combined with captain Darren Sammy to score 204 runs, the second-highest partnership for the West Indies' seventh wicket. In October 2012 he was selected for the Melbourne Renegades in the 2012/2013 Big Bash T20 League. He was involved in controversy during the Melbourne derby on January 6 against the Shane Warne-led Melbourne Stars; during the Stars' innings, Samuels held back David Hussey at the non-striker's end when the batters were trying to take a second run off Samuels' bowling. Warne reacted angrily to this when he was later bowling to Samuels himself; he continuously sledged Samuels, asking if he was going "grab hold of my shirt too, Marlon?" The incident escalated when Warne, appearing to attempt to throw the ball to the wicket-keeper, tossed it gently at Samuels, who responded by throwing his bat in Warne's direction. This led to an angry confrontation between the two mid-pitch. Both players were suspended, but Samuels missed the rest of the BBL season in any case, as he received an injury due to a bouncer from Lasith Malinga in the same game. The pair have been far from kind about each other in interviews since this incident. Samuels also has something of a feud with Ben Stokes; this began during the England cricket tour to the West Indies 2014-15. In the Second Test match, in which Samuels scored a century, he mocked Stokes' attempts to distract him with sledging as he batted, saying that it only concentrated his mind on the job in hand. When Stokes was then dismissed for 8 on Day 3 of the same match, Samuels saluted the departing batsman. 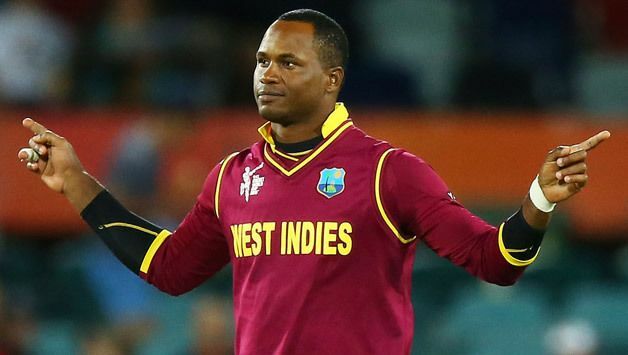 The feud resurfaced during the final of the 2016 ICC World Twenty20, during which Samuels scored a crucial 85. Stokes bowled the final over of the match to Carlos Brathwaite, with Samuels at the non-striker's end. After Brathwaite hit 4 sixes to win the game for the West Indies, Samuels claimed that Stokes "never learns". 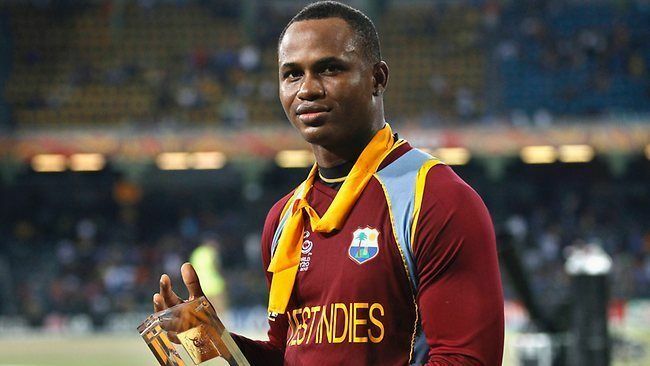 Samuels was the West Indies cricketer of the Year 2016. In February 2017, he was cleared to resume bowling in international cricket by the ICC. He was banned from bowling at the international level for 12 months in December 2015, after his action was found to be illegal for a second time in 24 months. He helped both Peshawar Zalmi to win the 2017 Pakistan Super League, and Kowloon Cantons to win the 2017 Hong Kong T20 Blitz. Despite this recent success, he was not selected until the 8th round of the 2017 Caribbean Premier League Draft, as he was picked up by the St Lucia Stars. Samuels was named man of the match in the final of the 2012 ICC World Twenty20, in which the West Indies beat Sri Lanka by 36 runs to claim the title. He scored 78 off 56 balls, an innings which included six sixes and three fours. 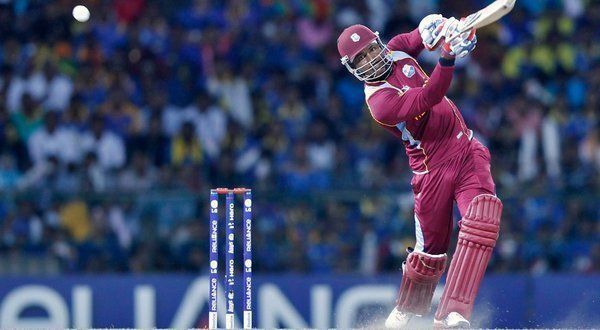 Samuels was also named man of the match in the final of the 2016 ICC World Twenty20 in which he scored an unbeaten 85 off 66 balls to help West Indies beat England by 4 wickets and capture their second World Twenty20 title. He is the younger brother of Robert Samuels, also a West Indian cricketer. First player to receive 2 Player of The Final awards in ICC World T20 history.He also became only the 2nd player after Shahid Afridi in history to score a half century and to take at least a single wicket in a T20 World Cup final. He holds the record for the highest individual score in a ICC World T20 final(85) and also holds the record for the highest score in a successful chase in a ICC World T20 final in 2016.